Numbering 125,000 in Mali and 175,000 in Burkina Faso, the Bwa are divided into three endogamous castes: farmers, blacksmiths, and griots (bards and musicians). 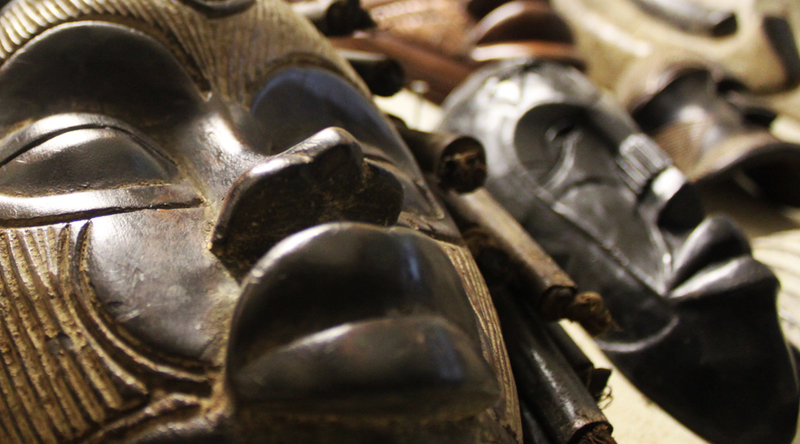 Wooden masks are found only among the Bwa in the south. The majority of masks have a circular face with geometric designs painted in vivid colors, and is surmounted by a large plank with a crescent-shaped motif at the end. The eyes set off by concentric circles, for instance, are intended to recall an owl, and the hooked shape extending from its forehead alludes to the hornbill. These masks represent animals: antelopes, warthogs, wild buffalo, monkeys, crocodiles, serpents, fish, birds, and insects, along with some human beings, and bush spirits who take on supernatural forms. The motifs are symbols linked to Do and to the history of the clan. Bwa figures are relatively rare and are associated with divination ceremonies and human and agricultural fertility rites. They are paraded through villages and are offered sacrifices. The Bwa sculpt divination canes with curved ends; diviners use copper or brass bracelets decorated with standing figures that represent the spirits.